[The City of Seattle is the first municipality to try a new] technology [that] may allow peaceful coexistence with Canada geese, whose daily 5-pound poop production has had officials here and in other cities killing them by the thousands…. According to the state Department of Fish and Wildlife, Washington state has about 70,000 resident Canada geese — each producing as much as 5 pounds of waste per day. [The inventor] , a welder, said he came up with the machine after goose droppings on Victoria play fields got in the way of a kids’ soccer team he coached. The 4- by 4-foot trailer is towed behind a small lawn tractor. 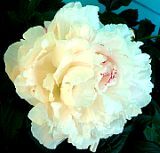 A gas-powered motor turns the nylon bristles to “tickle” the grass without damaging it. Droppings and other debris go into a hopper made of a special plastic that can hold up under nitrogen-laden droppings. In a test run this week at a park near downtown, the hopper was quickly loaded — not only with poop, but also old turf plugs, cigarette butts and spent fireworks…it can also pick up lighters, bottle caps and even syringes. A [Painesville, Ohio] judge ordered two paintball shooters to take aim at their own cars in order to stay out of jail. Joshua Breeding, 20, and 19-year-old Christopher Lyons were found guilty on Thursday of splattering up another man’s vehicle with paintballs in May. They each got a sentence of 60 days in jail. Municipal Court Judge Michael Cicconetti gave them the option of shooting their own cars with paintballs and then cleaning up the mess. They also have to spend 40 hours painting at a Habitat for Humanity home. The judge also ordered the pair to apologize to their victim and pay court costs. You love your pet fish, but constantly neglect them, leaving them to feast on each other’s soft cadavers like a Uruguayan rugby team. 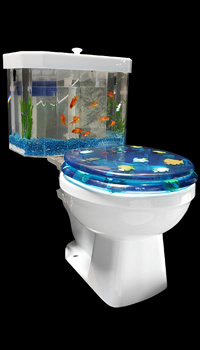 Instead, integrate them into a mandatory part of your life with Fish n’ Flush: a fully-functioning aquarium/toilet tank. Developed by California-based Aqua One Technologies, the FnF is a filtered acrylic aquarium wrapped around an integrated flush-tank core. The aquarium exists independently of the toilet’s reservoir, so you won’t annihilate your buddies after every urination. But, to keep things interesting, the flush valve does launch a jet stream into the tank that swirls the fish for a few seconds of exhilirating tidal joy. Wee. What’s gold and vaporizes when lightning hits? A Russian teenager survived a lightning strike which was so powerful it vaporised a gold cross on her neck. The bolt hit Marina Motygina, 16, from Ekaterinburg in western Russia on the top of her head and seared through her body into the ground. The necklace she had been wearing was ‘atomised’, leaving burns in the shape of a cross on her neck, Komsomolskaya Pravda reported. Only a couple of links of the chain could be found. A doctor at the local hospital who treated her said: “It is a miracle she has survived. She is fine now but will be staying in hospital for another two weeks. July 21, 2006 Posted by oldstersview | Uncategorized	| Comments Off on What’s gold and vaporizes when lightning hits? A cafe called Osama opposite the US embassy in Belgrade has been told to change its name after diplomats complained. The word Osama means ‘secluded’ in Serbo-Croat and cafe owner Milomir Jeftic said he had named his shop after a local shelter for the homeless. But he has been told to change it after an official complaint from the US Embassy, local media reported.